We suggest you create a restore point before you update your device drivers. A restore point allows you to restore your operating system to a previous state. This is helpful especially when you’re having issues with the new drivers. If you use the Pro version of Driver Easy to update drivers, it’ll automatically create a restore point before it install the drivers for you. 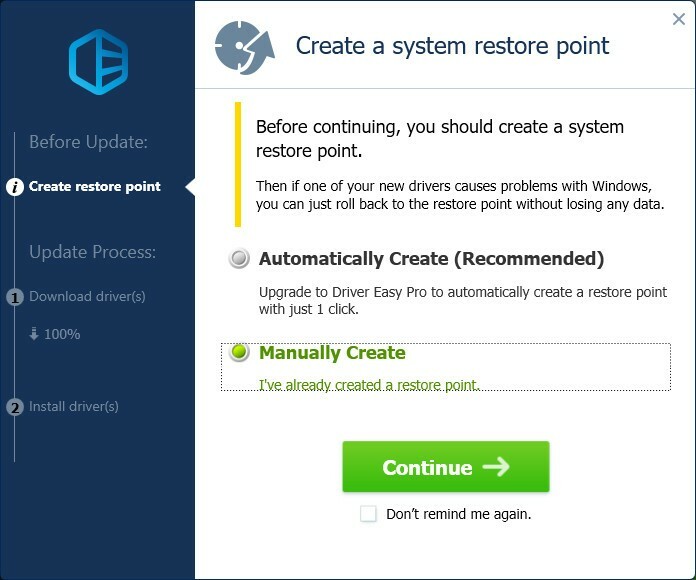 If you use the Free version of Driver Easy, you’ll need to create your restore points manually. If you are using Windows 10, go to How to Create a Restore Point in Windows 10. If you are using Windows 7 or Vista, go to How to Create a Restore Point in Windows 7 & Vista. If you are using Windows 8 or 8.1, go to How to Create a Restore Point in Windows 8 & 8.1. If you are using Windows XP, go to How to Create a Restore Point in Windows XP.